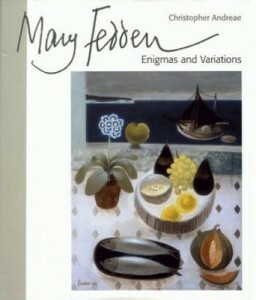 Mary Fedden left school to study at the Slade School of Art at the age of sixteen. After leaving the college she made a living teaching, painting portraits and producing stage designs for Sadlers Wells and the Arts Theatre. At the outbreak of the Second World War Fedden served in the Land Army and the Woman’s Voluntary Service and was commissioned to produce murals for the war effort. In 1944 she was sent abroad as a driver for the Navy, Army and Air Force Institutes. In 1951 Mary Fedden married the artist Julian Trevelyan who she had met before the war. They took a studio on the Thames River at Chiswick, where Fedden, in her 90’s, still lives and works today. Together, Trevelyan and Fedden travelled widely and even collaborated on a mural commission for Charing Cross Hospital. Fedden received several other commissions for murals, most importantly from the Festival of Britain (1951), the P & O Liner, Canberra (1961) as well as from schools and hospitals. From 1958-1964 she taught at the Royal College of Art and was appointed the first female tutor in the Painting School. Her pupils included David Hockney and Allen Jones. Subsequently, Fedden taught at the Yehudi Menuhin School and was elected Royal Academician. From 1984 to 1988 she was President of the Royal West of England Academy. She was awarded an honorary doctorate from the University of Bath and an O.B.E. for her work.